I found this recipe over on I Found Happy a few weeks ago and saved it in my "I want to make this" file. I'm really glad I did. She has a lot a great pictures of the process that I neglected to take. 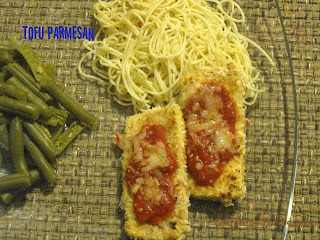 As you can see we ate it with spaghetti and green beans. Yum! 1. Drain tofu and press to get out excess water. Slice tofu in 1/4–1/2 inch thick slices widthwise. You should end up with about 10 slices. 2. Measure flour into a bowl or on a plate big enough to fit a tofu slice. Beat egg and milk together in another bowl. Mix all breadcrumbs, spices and salt in another dish. 3. Take one tofu slice and dip it into the flour. Coat tofu on all sides with flour. Next dip into the egg mixture. 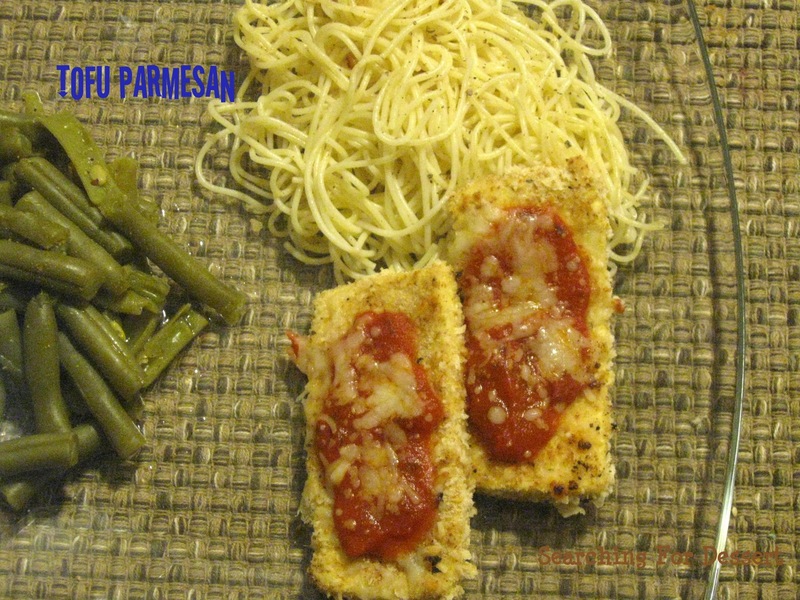 Finish with coating in the breadcrumbs, again on all sides. Repeat with remaining tofu. 4. Heat oil in a large skillet over medium heat until hot. If your pan isn't large enough for all slices, use only 1/2 the oil the first round. Gently place tofu slices into pan and cook undisturbed for 2 minutes. 5. Flip and cook for 2 minutes more. 6. Preheat oven to 350. Remove tofu to cookie sheet and top with shredded cheese. Bake until melted or browned to your liking (about 5 minutes). 7. Plate with some pasta and veggies, top with the marinara and dinner is done.